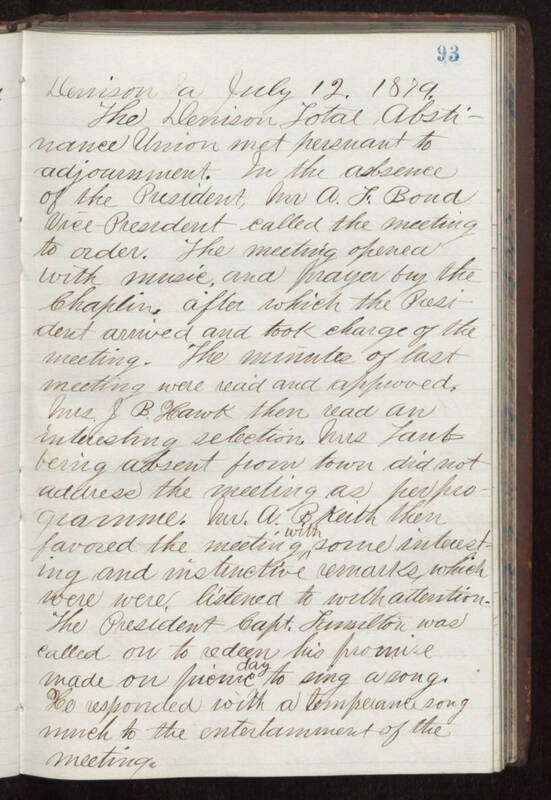 Denison a July 12, 1879 The Denison Total Abstinance Union met pursuant to adjournment. in the absence of the President, Mr A.F. Bond Vice President called the meeting to order. The meeting opened with music and prayer by the Chaplin after which the President arrived and took charge of the meeting. The minute of last meeting were read and approved. Mrs. J. B. Hawk then read an interesting selection Mrs Lanb being absent from town did not address the meeting as per programme. Mr. A.B. Keith then favored the meeting with some interesting and instructive remarks, which were were listened to with attention. The President Cap. Famillion was called on to redeem hi promise made on picnic day to sing a song. He responded with a temperance song much to the entertainment of the meeting.